Denim work shirts have long been popular in the workplace and out in the field, but where there exists a risk of an arc or flash fire, wearing a denim flame resistant shirt is what you really want. This Rasco Flame Resistant Workshirt in denim blue is a comfortable, durable 8.5-ounce 100% cotton twill that looks good, feels good and satisfies your company's requirement for certified FR clothing. 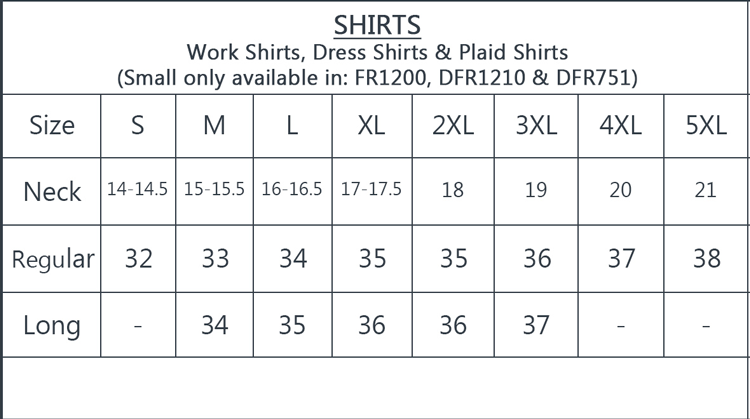 This flame resistant denim shirt carries an HRC 2 (Hazard Risk Category) rating, as defined by NFPA 70E. It's also got an ATPV (Arc Thermal Protective Value) rating of 9.2 and meets the specifications set out by OSHA 1910 and ASTM F1506. These qualifications make this shirt ideal for electricians and utility linepersons, chemical and refinery workers and pulp/paper industry workers, where there exists a risk of dust explosions. While the safety aspects of this Rasco FR workshirt are noteworthy, nothing is lost on function over form! This is an attractive denim pearl snap shirt that portrays a somewhat western look with triple pearl snaps on each cuff, one additional pearl snap on the sleeve vent, plus snaps down the front and on each breast pocket with flap closure. It looks good, feels good and does the job. Average Customer Review: 4.5 of 5 Total Reviews: 52 Write a review. So my boyfriend is a smaller dude. 5'5. I ordered this in a small. And it's way too big, and they dont carry XS. So they're literally just sitting in my closet, not being worn. Good quality but cannot be worn. Second time to purchase Rasco denim 8.5 oz shirts. I purchased 14 in 2014 and they lasted me till 2019. Just purchased 14 more. For this price, you cant beat these shirts.